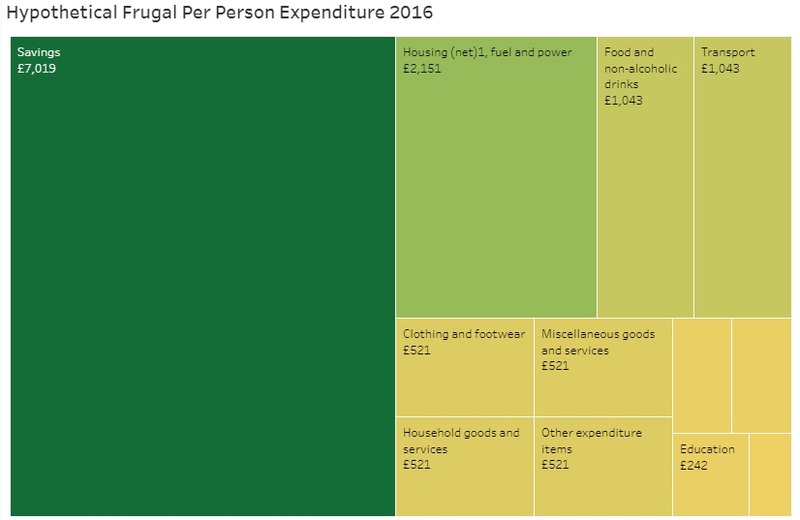 And the simple maths below show how simply spending like this, at the median (per person) level for UK households, is enough to lock you in to a 40 year working life, and tie you to the typical retirement age of 68, which to my mind is possibly a fate worse than death itself. Gross total annual median pension income aged 68-81 = £14, 069/ year (note 7). Net Median Annual Pension = £13, 845.20 (see note 7). I’ve used a 40- year compound model which assumes someone starts saving for their pension at age 28 and retires at age 68, so this gives Mr or Ms ‘median’ a few years of down-time to do a degree, go travelling, retrain to change career, or (mostly for Ms) to take a career break to procreate. In reality, for today’s youngsters things are going to be worse than this - current median expenditure does not take into account £30K on repaying a degree, or the increasing amounts of money they’ll have to spend on housing moving forwards. But there is hope if you want to retire earlier than this…. NOW, given that we’re working with the ‘median’ case, as I see it the average person probably has more capacity to spend-less than they do to earn more, given the limited opportunities available to do the later, so I just want to focus on how far towards early retirement spending less can take the median income earner! £7157 annual savings compounded at 4% interest over 16 years = £162,446.10. You have to hold out for 24 years until the state pension kicks in (which you can now live off easily because it’s now more than what you’re used to living off). £162,446.10, drawn-down over 40 years @ £7157/ year would in fact last you for another 25 years, so you have a year in hand. I started out on an early-retirement mission almost 4 years ago now, and I’m currently on target to retire at 49 (in 2022). 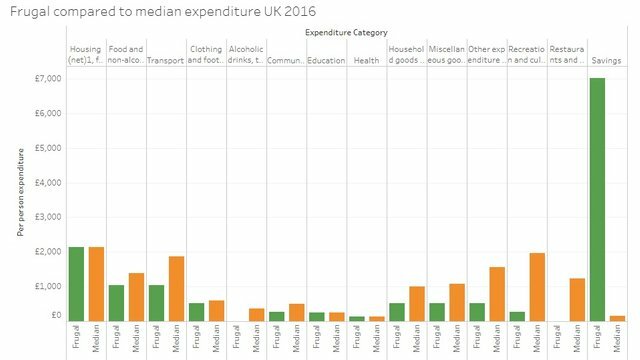 A significant part of my strategy towards early retirement (which I’ll outline another time) has been to reduce my expenditure on what I call ‘frivoloties’, which in turn was based on some analysis I did back in 2014 of how median expenditure, or just ordinary spending (in the UK) locks the individual in a long working life. This post is simply an update of this analysis, based on 2016 figures. 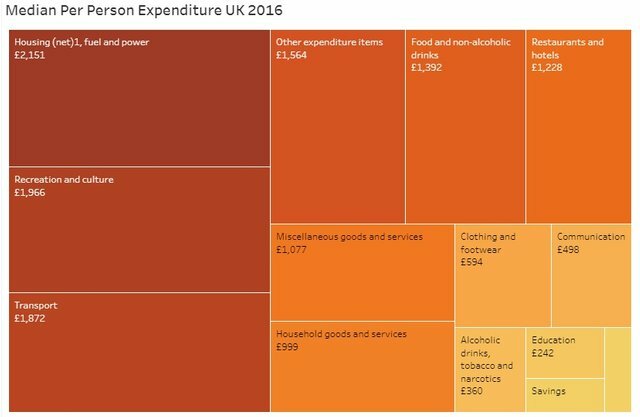 (3) Based on (UK median annual income) - (UK median annual expenditure). Note I’m not adding this into the pensions mix - it’s too small a figure to worry about - let’s call it ‘rainy day money’.! The £664 figure was calculated using the moneysavingexpert tax calculator - I basically messed around with the Gross income at 4% until I got the disposable income the same as in (1) above, and then doubled the pensions contribution to reflect the employer’s contribution. NB this part of the equation is an an approximation! Drawdown calculated using Which draw-down calculator - assuming the maximum 25% is taken as a tax-free lump sum (£15, 774) then a yearly draw-down of £4300 will last for 13 years, which takes the individual to the median projected age of death based on current average life expectancy of 81 years, assuming a retirement age of 68. I then applied the same draw-down calculation to the £15, 774 to get a figure of £1450. £4300 + £1450 = £5750. Settings were all set at the middling levels of risk and return for investment. (7) Unbelievably pensions income is taxed in the same way as earned income - so to get this figure I’ve simply taken off 20% tax (£223.80) on the chunk over the current personal allowance, but not including the tax free lump sum taken out (sensibly) @ age 68. (8) I may have been a little gung-ho about cutting all of the expenditure, so I’m going with the fair option here of saying that I’ve cut out the pensions contributions which are included in the median model. However, I am still including the employer contributions! Bit approximate I know, just been writing this too long already, sorry! Let me know if you have any questions regarding the project or nomination. Hope to hear from you soon! Hi - Very kind - I think I might have to come over and pitch in to the whole @ocd project/ movement too!